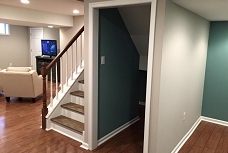 To whom it may concern, This summer our family contracted Elkin Jaramillo Home Enhancements to finish our basement and install an egress window. We were extremely happy with the finished product and especially the level of professionalism displayed through every member of his team. During the process, Elkin took time to discuss what was accomplished that day and what next steps were coming. Needless to say, my family and I would use Elkin Jaramillo Home Enhancements for any future projects in our home. I have personally passed his name onto two close friends and would confidently recommend them to anyone interested in remodeling their home. Dear Mr. Jaramillo: I want to thank you for the high quality of services Jaramillo Home Enhancements has rendered to my family’s home on two separate occasions: the design and construction of our finished basement in Parkesburg, PA and the enhancement of our aluminum siding in our West Chester, PA home. Unfortunately, it is difficult to retain the services of a reliable, highly-skilled home enhancement firm that is committed to customer satisfaction. Luckily for us, we were wise enough to select you to take on both of the aforementioned projects. 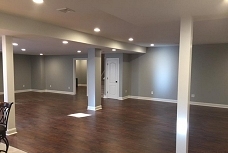 By converting our finished basement to a beautiful family room, you changed the way we lived our lives by providing ample space for our children to grow and develop. Furthermore, you helped us greatly increase the property value for our home. When we sold our home, potential buyers immediately fell in love with the family room. As a result, the home was not on the market long and we were on the receiving end of a very lucrative transaction. In addition, I want to laud the professionalism of your firm as a whole. In both occasions in which we have done business, you were always honest, forthright and reliable. Whether you were delivering materials to the job site, coming to our home at a scheduled time to perform services or returning a telephone call, you always acted in a timely manner. Such professionalism does not often come at such a fair price, and that needs to be recognized. You have assembled a quality team to assist you. Each of the men who you employ demonstrated attention to detail, neatness, congeniality, and consideration during the several occasions in which my wife, children and I had the pleasure to interact with them. I can say that my family and I trust you and your employees, and that is the highest compliment I can pay anybody. In summation, my family and I could not be happier with the work that you did for us and the manner in which you did it. I would be happy to share my thoughts about Jaramillo Home Enhancements with anyone who is considering retaining your services. Please encourage them to contact me by telephone at 610-696-0655. Thank you and rest assured I will be in touch, as future home enhancements are on our horizon. To whom it may concern, We have enjoyed working with Elkin for the past 15 years and have had great success with his company. He has been very dependable throughout the years & his employees have always been reliable, completing work on time. Their workmanship has been outstanding & Elkin always stands behind his work. Any conflicts that may arise or customer requests, Elkin will take care of until everyone is satisfied. He has always been very conscientious & is always willing to lend us and equipment he has to make our job easier. He has been a great sub-contractor & we will continue to use his services in the future whenever the need arises. To whom it may concern: I have known Elkin Jaramillo for over 12 years. Through those years, I have hired Elkin to do a variety of projects at my home and in our office building including painting (interior and exterior), lawn and garden maintenance, and miscellaneous household improvement projects. Elkin is reliable, honest and his work is our superior quality. He is an excellent businessman, following through on his scheduling commitments and doing an excellent job. He does what he says he will do when he says he will do it. Elkin is smart, capable and possesses a high degree of integrity. He has excellent communication skills and takes great pride in his workmanship. I have also been very pleased with the quality of work by Elkin’s employees, and with the effectiveness of Elkin’s supervision. In addition to the things I hire Elkin to do on a regular basis, I always call him first for the unusual tasks that crop up. I know that when I call, Elkin will always help me if he can. I would recommend Elkin Jaramillo for any job he agrees to do. I think you will be very happy with the results. To whom it may concern, This letter is written to share our experiences with Elkin Jaramillo Home Enhancements. We have hired Mr. Jaramillo to provide various home enhancements to our residence and business over the past 7 years. Jobs included deck staining, and interior and exterior painting. Mr. Jaramillo and his employees have always been conscientious and meticulous in their work, and we have always been completely satisfied with their service. Mr. Jaramillo is prompt to address and concerns during the job, and always begins and completes the jobs within the agreed upon time frame. I would continue to feel confident hiring him and would highly recommend his services to anyone looking for a dependable and competent contractor. Mr. Jaramillo takes great pride in his work and sincerely puts his customer needs and wants foremost in ensuring that his work meets their specifications. Dear Elkin: It’s just over a month since you completed our basement and we want you to know that we are very happy. It was a pleasure doing business with you. We must say your employees are very good, competent and neat workers. They did their best to be as unobtrusive and as courteous as possible. As difficult as it is to get and keep good employees you have the skills and demeanor to instill a real sense of loyalty in your people that translates directly into exceptional results for your customers. We are in awe of the work you did, square corners, seamless drywall, great ceilings, clever enclosures and although unseen now amazing fire blocking. We thank you once again for such a great job. We are using and enjoying our new basement very much. Dear Elkin Jaramillo, I just had to write you and say how much we enjoying our new basement. After being burned by another contractor, I was a little gun shy of hiring anyone ever again. We really appreciated your input on how the layout should go and I am so happy that we listened to you. You were right I did not need all that storage space. Your workers were polite and cleaned up after themselves; also you guys were always there when you said you would be. Thank you for making our experience an enjoyable one. I will definitely be spreading the good word regarding your company. Letter of Reference for Elkin Jaramillo: Elkin has done work for me since September 2004. 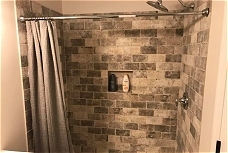 He completed a large paint job which included our several rooms on the first floor of the house (including double story foyer and ceilings) and a bedroom, as well as a small construction job for us in our basement (he built a platform for our home theater seating). His work is excellent and his employees are very professional. Elkin and his team always arrive on time and make sure to work in your home with minimal interruption to you. They are always very neat and clean up after their projects. I have used several painters over the years and found Elkin’s work to be of very high quality as compared to some of the others. He is starting another project for me painting bedrooms and will do additional small projects for me in the kitchen and basement. I will continue to use Elkin for all painting and construction projects in the near future. We are also considering a larger structural construction project and would use his services for that project as well. I would highly recommend Elkin for any painting and construction projects. If you have any questions or need additional information please feel free to contact me directly. Elkin- It was very much appreciated. Thank you so much for all of your hard work in our basement. You really helped us out tremendously and we are very appreciative. We hope you enjoy a night out with Mary. Thanks again!! To whom it may concern, Elkin Jaramillo has done work for us going on thirteen years. His largest project for us was renovating our office and apartments after a fire in February, 1994, for which he performed an amazing task and job well done. He has performed numerous other jobs for us, all of which we have been more than pleased. We do not hesitate to call Elkin first to see if he wants a job we need done. He is honest, fair, timely and a pleasure to work with. Dear Elkin, It has been a pleasure to work with you and your team. The work was completed in a timely and efficient manner with a minimum of fuss. Please extend our thanks to everyone for a great job, especially Kenny, Jose, Bob, Reese and Gabe. We love our new basement! If you ever need a referral let me know, I’d be happy to tell anyone how great you and your team are! Thank you for everything! Dear Elkin, Thank you so much for the wonderful work that you and your team did on our basement. We are so happy with the outcome. You expertly helped us transform a quirky, dull area into a beautiful, comfortable living space. We have received so many compliments on the entire project, and we are truly thankful for your hard work. We would also like to express our thanks to all of your employees. Juan, who was here most days, was extremely polite and professional. He was so kind to our children that they are asking when he’ll come back to do more work for us! Your electricians, plumbers, and ventilation contractors were also professional and accommodating. It’s not often that you can say you were happy with all of the workers on a job, but that was definitely the case here. We appreciate that you were able to stay within our budget and that there were no hidden costs in your proposal. 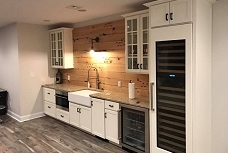 You were so easy to work with—accepting our ideas such as the slate floor for the bathroom and the truly functional (rather than just decorative) wine cellar. We hope you’ll be available for whatever project we take on next!